My name is Jono, and I am passionate about the BBC. Like many others, I am a big fan of the hit shows that BBC Three has produced and I have grown up watching them for the last 11 years. After hearing Tony Hall's comments I set this petition up because I believe the organisation needs to be investing more in content for teenagers and young adults, not less. Scrapping Three, and relegating content to the internet with a much smaller budget, will be a big mistake. The BBC needs to cater for all ages, and this petition is designed to give young people a voice about these cut backs. BBC Three has produced exciting, original television programming for 16-34 year olds since 2002. It has been a launchpad for programmes like Being Human, Torchwood, Russell Howard's Good News, Mighty Boosh, Bad Education, Gavin and Stacey, and Little Britain. Unlike other BBC channels it takes risks. It offers live debates and documentaries, and has won more awards for programming than any of its key competitors. This year it was voted 'Channel of the Year'. It is also the channel for young people to go to for live music – something which is often relegated from the other main BBC television channels. Where else on TV would dedicated coverage of Reading and Leeds, T In The Park, and Radio 1's Big Weekend fit if it was not on BBC Three? The red button has already faced cuts on Freeview. We believe that the BBC does not do enough to cater for young adults, and scrapping BBC Three from cable, satellite, and terrestrial television would be a big mistake. While broadcasters should invest in new online ideas the BBC should not take Three off our TV screens. With this move there will be less money for quality programming, and it will restrict access for many rural areas, as well as those without an active broadband connection. 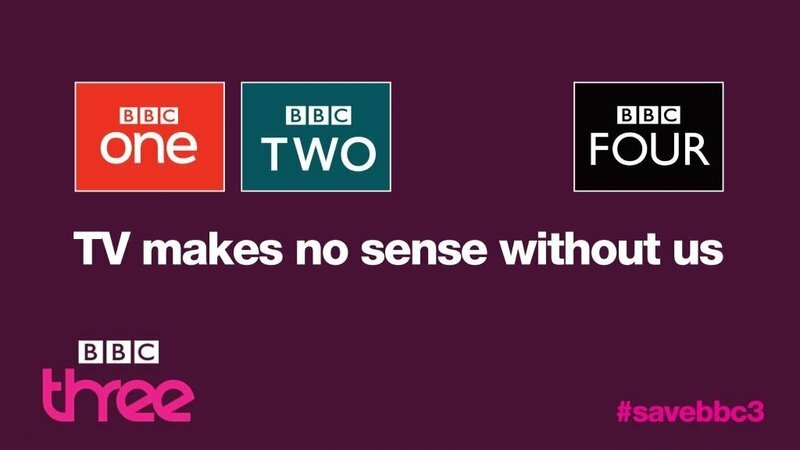 Furthermore, the BBC is wrong to then redirect the cash to launching a BBC1 +1 channel at a time at a time when the BBC wants people to turn to the 24/7 iPlayer. We're calling for the BBC Trust to save Three and for the organisation to continue to invest in new comedy, drama, drama and music programming for young adults in its rightful home. The BBC Trust said in 2014 that BBC Three was the best BBC channel at appealing to young and diverse audiences – the BBC should do everything it can to continue to keep them engaged.